48 x 48 mm. Large White PV Display That's Easier to Read. Easy to Use, from Model Selection to Setup and Operation. 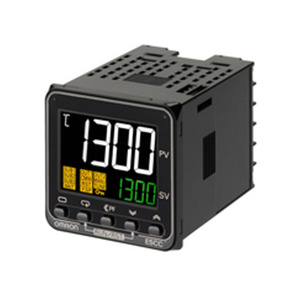 A Complete Range of I/O Capacities, Functions, and Performance. Handles More Applications. 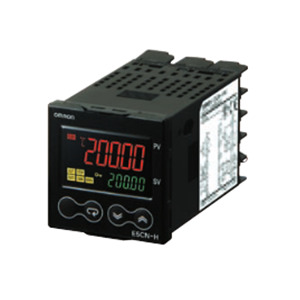 E5CC-B is our Value Design product which increase the value of your control panel. 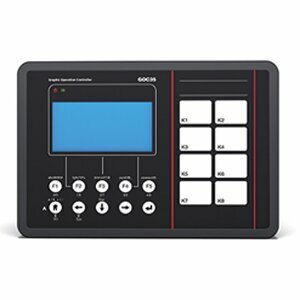 Control Panels: The Heart of Manufacturing Sites. Evolution in control panels results in large evolution in production facilities. 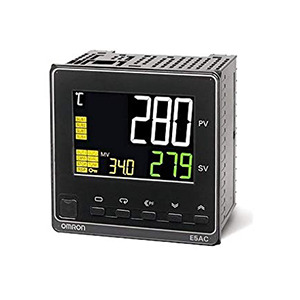 And if control panel design, control panel manufacturing processes, and human interaction with them are innovated, control panel manufacturing becomes simpler and takes a leap forward. 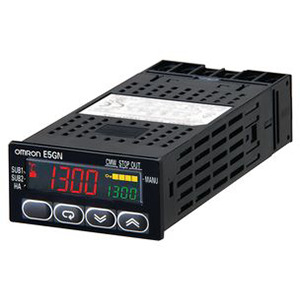 OMRON will continue to achieve a control panel evolution and process innovation through many undertakings starting with the shared Value Design for Panel *1 concept for the specifications of products used in control panels. Our shared Value Design for Panel (herein after referred to as "Value Design") concept for the specifications of products used in control panels will create new value to our customer’s control panels. Combining multiple products that share the Value Design concept will further increase the value provided to control panels. 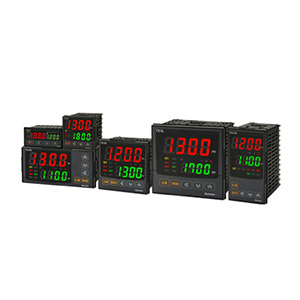 • A wide range of lineup to handle various control panel/equipment sizes. 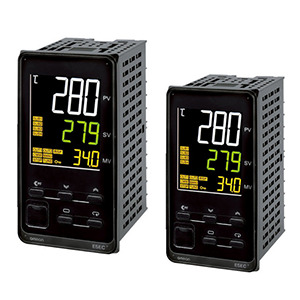 • Advanced control performance to help increase equipment speed and yield. 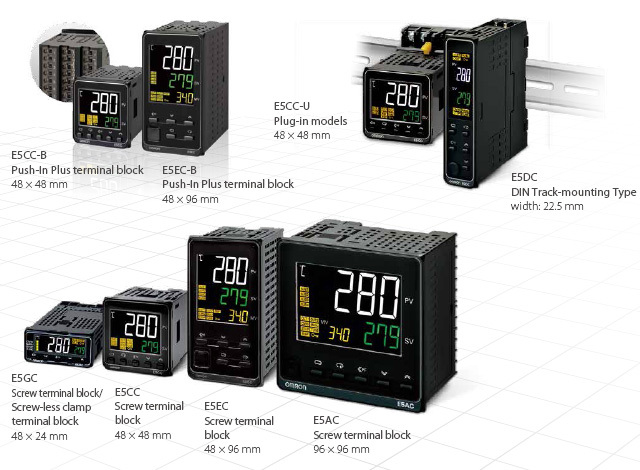 • Saves your work in each process from designing to operation of control panels and other equipment. • Wide viewing angle and high-contrast LCD for high visibility. 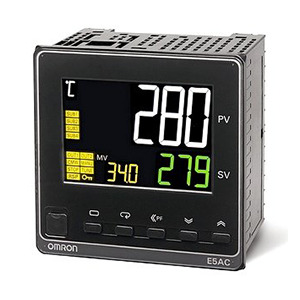 • Reduces the workload of entering set values on-site. Certified for main safety standards. A short body that’s 77% of our previous model has been achieved. 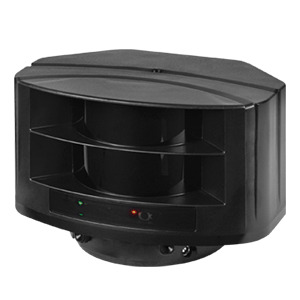 This makes the Controller applicable in tight spaces with limited depth. 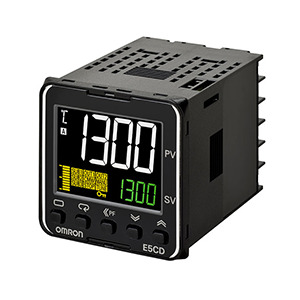 Even with the 48 × 24 size, OMRON has achieved a PV display character height of over 10 mm and dual displays for the present value and set point. 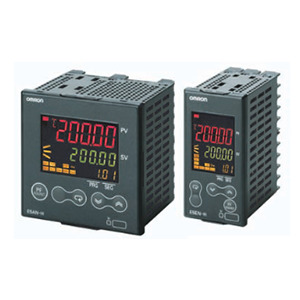 This enables compact panels that are easy to read. 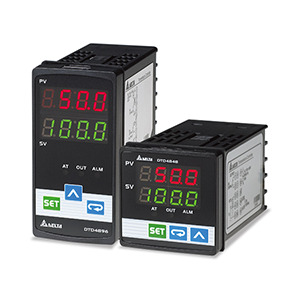 The unified operability of the E5C Series in a DIN Track-mounting Controller that is 22.5 mm wide. You can achieve space-saving layouts in control panels. 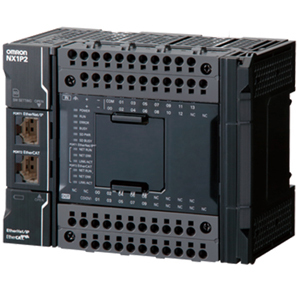 With Push-In Plus terminal blocks, wiring is performed from the back, which facilitates using horizontal group mounting, to achieve compact panel surfaces. You get stable control without overshooting. 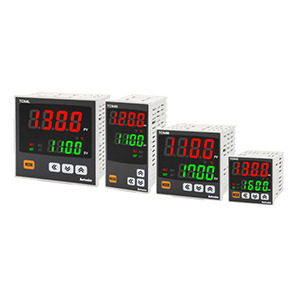 Robust tuning(RT) : Used with heaters whose temperature increases quickly to automatically set the optimum PID constants. Stable control is achieved even for hard-to-control water-cooled extruders with tuning for water cooling. Stable control also means that you’ll save energy. Tuning for water cooling : Uses a tuning algorithm designed for water cooling, which is different from normal cooling methods, to automatically set the optimum PID constants for water cooling. Big white characters on a black background achieve superior visibility. 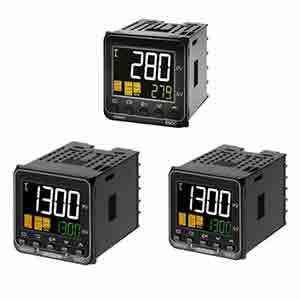 Operator movement distances are minimized to help increase work efficiency. 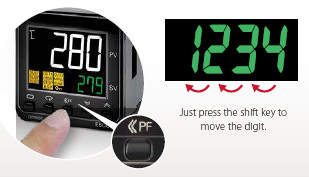 High-contrast displays enable easier confirmation regardless of ambient lighting conditions. A wide viewing angle was achieved with the LCDs to enable easy confirmation of the PV. Reduces the workload of entering set values on-site. 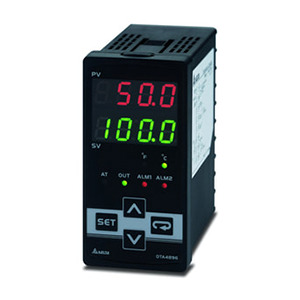 Functions are provided to reduce work in operating and changing settings for the Controllers. Just press the shift key (<<PF) to move the digit. This simplifies numeric entry at worksite. Use parameter masks to display only the required parameters. 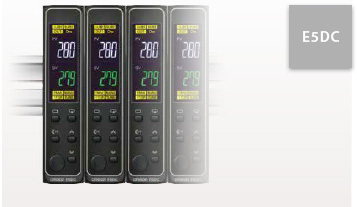 The time required to change settings, such as for changeovers, is greatly reduced. 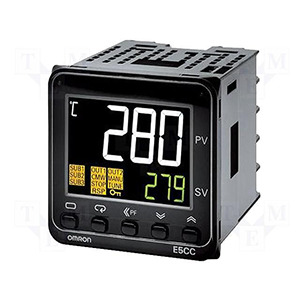 Current input: 150 Ω max., Voltage input: 1 MΩ min. 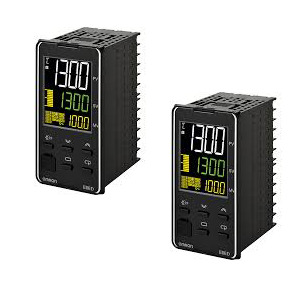 Contact input: ON: 1 kΩ max., OFF: 100 kΩ min. 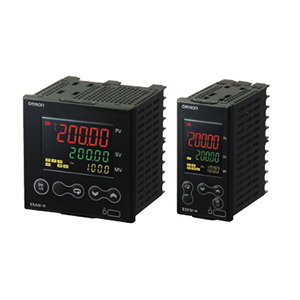 Non-contact input: ON: Residual voltage: 1.5 V max., OFF: Leakage current: 0.1 mA max. *1. There are no optional functions for the E5CC-U. Refer to Model Number Legend and List of Models on Data Sheet. *2. This function is not supported by the E5CC-B. Refer to Model Number Legend on Data Sheet. *3. 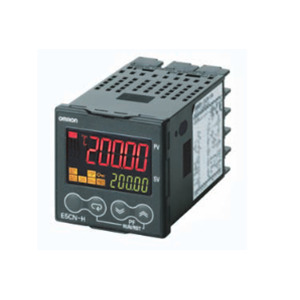 With the E5CC-B, there can be up to four set points if event inputs are used to select them. Please click image to enlarge (open in a new window). 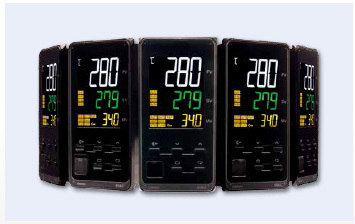 * The range applies to the E5CC-U only for those manufactured in May 2014 or later. Auxiliary outputs are allocated for alarms. ON delays and OFF delays (0 to 999 s) can also be specified. To use alarm 1, set the output assignment to alarm 1. Analog input: ±0.2% FS ±1 digit max. CT input: ±5% FS ±1 digit max. ± 0.2% FS ± 1 digit max. Analog input: ±1%FS ±1 digit max. Remote SP input: ±1% FS ±1 digit max. whichever is greater) ±1 digit max. *2. However, the precision between 0 and 4 mA for a 0 to 20 mA output is ±1% FS max. *4. 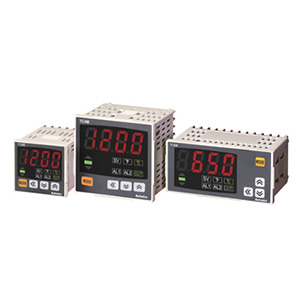 K thermocouple at -100°C max. : ±10°C max. *5. The unit is determined by the setting of the Integral/Derivative Time Unit parameter. *6. External communications (RS-485) and USB-serial conversion cable communications can be used at the same time. *7. 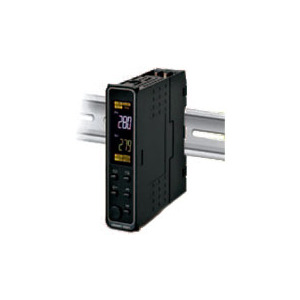 CX-Thermo version 4.67 or higher is required for the E5CC-B linear current output type. Socket. 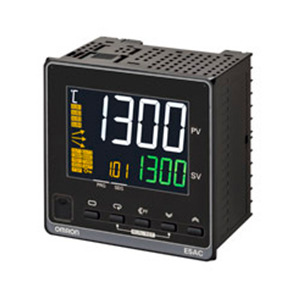 The P3GA-11 is not certified for UL listing. Conforms to USB Specification 2.0. Windows is a registered trademark of Microsoft Corporation in the United States and or other countries. *1. 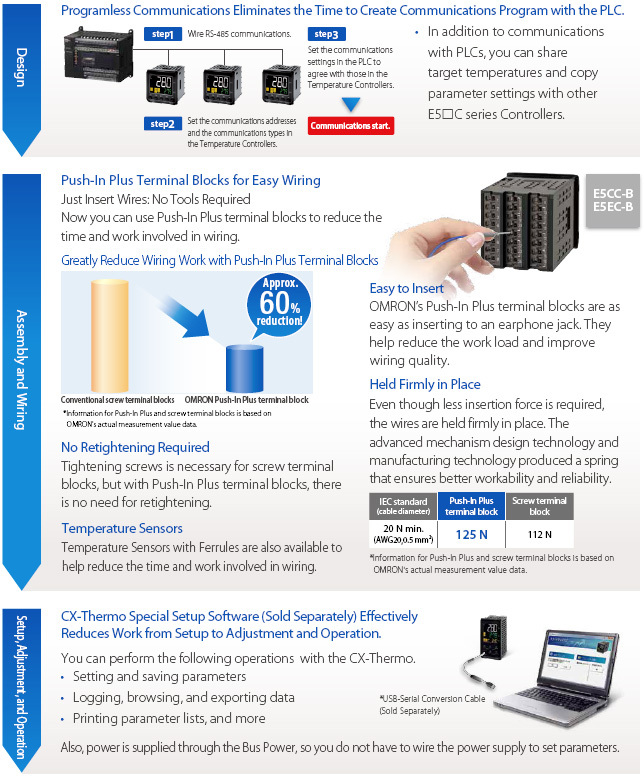 CX-Thermo version 4.65 or higher runs on Windows 10. *2. Use a high-power port for the USB port. *3. 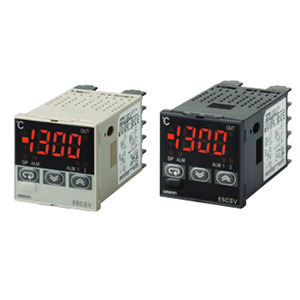 CX-Thermo version 4.67 or higher is required for the E5CC-B linear current output type. 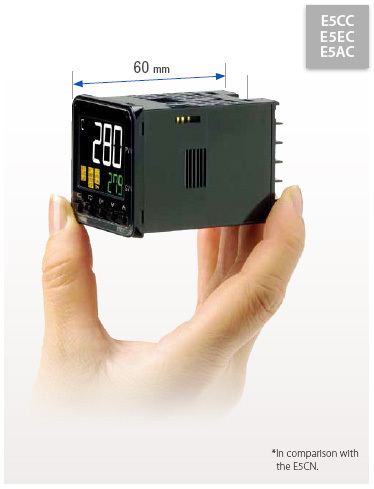 You can use the memory in the PLC to read and write E5C parameters, start and stop operation, etc. Controllers that are set as slaves. Slope and offsets can be set for the set point. MELSEC is a registered trademark of Mitsubishi Electric Corporation. KEYENCE is a registered trademark of Keyence Corporation. 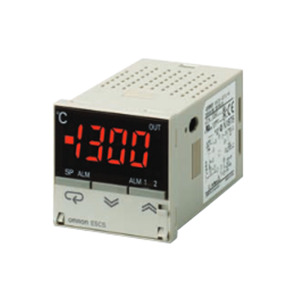 *1 A Temperature Controller with version 1.1 or higher is required. 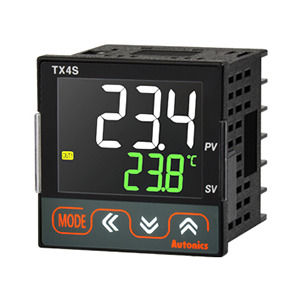 A Temperature Controller with version 2.1 or higher is required for the FX Series or the KV Series. *2 Both the programless communications and the component communications support the copying. ± 5% FS ± 1 digit max. 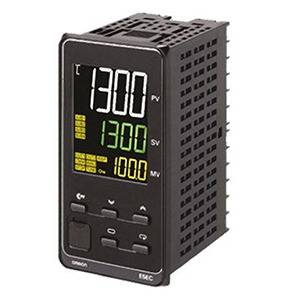 ON if the heater current is lower than the set value (i.e., heater burnout detection current value). if the heater current is higher than the set value (i.e., SSR failure detection current value). 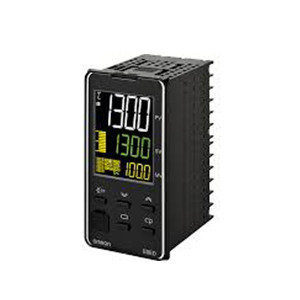 *3 The value is 30 ms for a control period of 0.1 s or 0.2 s.
*4 The value is 35 ms for a control period of 0.1 s or 0.2 s.
The Setup Tool port is on the top of the Temperature Controller. 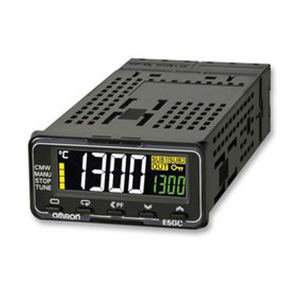 It is used to connect the Temperature Controller to the computer to use the Setup Tool. The E58-CIFQ2 USB-Serial Conversion Cable is required to make the connection. Refer to the instructions that are provided with the USB-Serial Conversion Cable for the connection procedure. Note: Do not leave the USB-Serial Conversion Cable connected when you use the Temperature Controller. 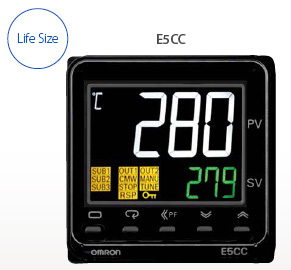 The Waterproof Packing is provided only with the E5CC/E5CC-B. It is not included with the E5CC-U. Order the Waterproof Packing separately if it becomes lost or damaged. The Waterproof Packing can be used to achieve an IP66 degree of protection. (Deterioration, shrinking, or hardening of the waterproof packing may occur depending on the operating environment. Therefore, periodic replacement is recommended to ensure the level of waterproofing specified in IP66. The time for periodic replacement depends on the operating environment. Be sure to confirm this point at your site. The E5CC-U cannot be waterproofed even if the Waterproof Packing is attached. Note: 1. Use this Adapter when the Front Panel has already been prepared for the E5B. 2. Only black is available. Serial Conversion Cable to make the settings, do so before you mount the Temperature Controller in the panel. 4. You cannot use it together with the Y92F-49 Adapter that is enclosed with the Controller. Note: This Adapter cannot be used together with the Terminal Cover. Remove the Terminal Cover to use the Adapter. This Adapter is used to mount the E5CC to a DIN Track. If you use the Adapter, there is no need for a plate to mount in the panel or to drill mounting holes in the panel. The Mounting Adapter is provided with the Temperature Controller. Order this Adapter separately if it becomes lost or damaged. Note: This Protective Cover cannot be used if the Waterproof Packing is installed. This Protective Cover is soft type. It is able to operate the controller with using this cover. This Protective Cover is hard type. Please use it for the mis-operation prevention etc. Note: 1. A model with finger protection (P2CF-11-E) is also available. 2. You cannot use the P2CF-11 or P2CF-11-E together with the Y92F-45. Note: 1. Using any other sockets will adversely affect accuracy. Use only the specified sockets. 2. A Protective Cover for finger protection (Y92A-48G) is also available. 3. You cannot use the P3GA-11 together with the Y92F-45. 4. 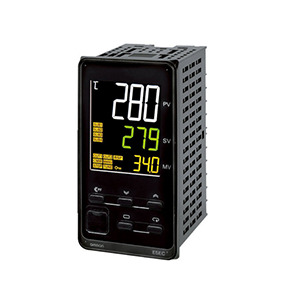 You cannot use this Adapter together with the Y92F-49 Adapter that is provided with the E5CC Temperature Controller.